The Contemporary Controls' EIGR series of Gigabit IP Routers are being introduced with features beyond our popular EIPR series of 10/100 Mbps IP routers while retaining the EIPR's ease-of-use. Besides gigabit speed on both LAN and WAN ports, the new line of EIGR Gigabit IP routers allows for faster routing throughput, VPN server in addition to VPN client, and outdoor temperature operation. In addition to the basic EIGR-E model is the EIGR-V offering the choice of OpenVPN client or server. Outdoor temperature range operation of −40°C to +75°C is supported with the EIGR-EX and EIGR-VX models. 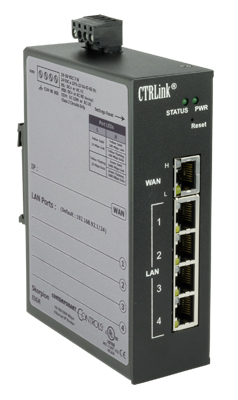 The EIGR-V Gigabit VPN router allows you to create secure VPN remote access to equipment located at the job site. The first approach is to use our cloud-based RemoteVPN subscription service hosted by Contemporary Controls along with the new EIGR-V acting as a VPN client. With our RemoteVPN service you gain secure remote access eliminating the need to travel to the job site for activities that could have been accomplished remotely. Using the RemoteVPN service eliminates the need for Static/Public IP addresses. The second approach is to configure the EIGR-V as a VPN server and install it at your office with direct Internet access eliminating the need for the RemoteVPN cloud service. Another EIGR-V router, acting as VPN client, is installed at each job site that requires remote access. It can be behind firewalls and still communicate with the EIGR-V VPN server. Once installed, they provide a secure VPN connection between each other, providing you with secure, remote access to the connected devices on the LAN side at the job site. Visit the EIGR product page to learn more.